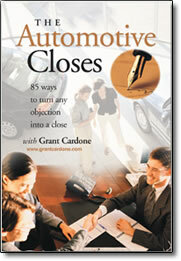 The Automotive Closes by Grant Cardone – Audio CDs or MP3 – Discount! Selling cars is all about closing the sale. It’s about providing such excellent service to the customer that they want to buy the vehicle from you, and only you, no matter the price, no matter the objection. With Grant’s classic The Automotive Closes, you get 85 of the slickest closes that will turn any objection into a close. It is said that the average customer will object five times before finally agreeing to a proposal. By survey, the average sales person has only four closes available and will quit prior to ever getting agreement from the buyer. This program will teach you how to finally quit selling, quit talking, and start closing. It will prepare you on how to handle any objection and close any situation. All great sales people understand that the close is the only step in selling that the sales person gets paid for. All of selling boils down to this one ability. This incredible program comes with a reference book to make it easy for you to find and use the exact closes you need while you’re on a deal! Not only will you learn the critical words and phrases Grant uses, but you will hear the tone and inflections that are so critical to your success in the close. Thousands of sales people have increased their income because of The Automotive Closes, the most complete and advanced compilation of closing word tracks available in the marketplace today. Listen on the drive to and from work, so the material is consistently being repeated and integrated into your selling approach. Practice the Automotive Closes with a friend or business associate to drill the material and guarantee you can use the closes confidently in any selling situation. Role play and demonstrate these closes in a sales meeting, guided by the sales manager. One close can be played and demonstrated to the group, followed by pairing up sales staff and drilling as described above. These strategies will ensure you get the most from your new closing program! Since its release, The Automotive Closes has helped thousands of sales professionals achieve higher closing ratios and reach higher levels of income, so quit selling and start closing!